Stephen “Doc” Kupka is a founding member of Tower of Power and, with co-founder Emilio Castillo, composer of most of the music the band has done over the last 40 years. A few years ago he formed the Strokeland Superband as an outlet for his composing beyond the music that fit Tower’s style. The band is not a live performing group, but only exists on recordings. In many ways Doc’s band was a “supergroup” – many current and former members of TOP recorded, as did Lydia Pense (formerly of Cold Blood) and Huey Lewis. Now Doc has gone one step further. 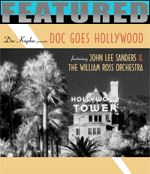 This CD is a collection of Kupka-authored or co-authored tunes, arranged by Hollywood arranger Bill Ross. They are all sung by John Lee Sanders, Alabama-born but now residing in Vancouver. On his notes on the Strokeland web site, Sanders says he was going for the sound Marvin Gaye had when he recorded a Nat King Cole tribute album with an orchestra in the 1960s. John Lee has a wide range of musical experience himself and also arranged and sang all the background vocals. It’s a very interesting sound, and combined with Doc’s unusual harmonic twists and turns, the tunes have that perfect blend of nostalgia from the “Great American Songbook” quality of the songs and freshness of Doc’s writing. It’s not exactly pop, or easy listening, and it’s certainly not R&B or funk, like TOP; check out Doc’s web site for some excerpts before you buy. You’ll be glad you did! A couple of years ago I did a post about my theory that many liberals believed what they did because they felt guilty about having a better life than other people – poorer people, people in other countries, people who are “less fortunate than ourselves” in some way. i still think that’s true of some rank-and-file liberals who don’t think a lot about their beliefs. I don’t think that’s true of liberal leadership, though. I think they are, pretty much without exception, and regardless of what level of leadership we’re talking about, more concerned with power than with the good of the people. Liberal leadership is basically interested in gaining and maintaining power. One of the best ways to gain power is to bribe people. No, really. We don’t call it that. We call it entitlements, Federal aid, grants, welfare, national foundations, earmarks and all other sorts of government largesse. Each one is a hook the liberal establishment can use to control a segment of the population. Again, not a revelation, right? But it’s amazing how any people don’t believe government money is a form of control. Even federal loans for college can be considered a hook. Liberals can most easily maintain their power bases if (a) they can convince people they need help – create victims; (b) can find enough ways to lock people into needing federal funding to survive; and (c) can use the distribution of federal funds to cause certain kinds of behavior. We’re not just talking voting behavior here, but demonstrations, petitions, “buying green,” and my personal favorite, attacking anyone who doesn’t think the same way. This is going on all the time. For example, schools are controlled by the federal government far more than the amount of aid they receive. No school district is willing to put up with the heat of public outcry for rejecting No Child Left Behind even if the amount of federal aid they receive barely makes a difference in their budget. In fact, in some cases the implementation of NCLB will cost a district far more than the total federal aid the district receives! That’s what amazes me about listening to Democrats. We’re from the government and we’re here to help you is just too seductive for many Americans, no matter how much people like to laugh about it. And we let them do it. We let them do it all the time – if for no other reason than that our district or state should receive “its fair share.” How about reducing that share across the board, for once? I can’t believe it – the International Association for Jazz Education (IAJE) filed for bankruptcy. Of course, it wasn’t posted until tonight, and I sent our application for my band to play at the conference THIS FRACKING MORNING! I don’t know the details and more than the statement that you can read on iaje.org. The organization has been around since the 1960s and I served as Illinois State President a bunch of years ago. The national conference, back when it was still the National Association of Jazz Educators, was the place where I made most of the contacts I have in the jazz community. It is truly a sad thing. Perhaps a new organization will be reconstituted to replace it…but it sure is too soon to tell. This is the version by the US Army Chorus as performed at the White House at the ceremony on April 16, 2008 for the visit by Pope Benedict XVI. Rush Limbaugh can’t stop talking about it. It is for certain something I would not have expected at a White House ceremony these days…another reason why, even when I’m not happy 100% with the decisions President Bush has made, he was the right man in the right place at the right time…and I thank God for it. You are currently browsing the The Old Gray Cat blog archives for April, 2008.